Summer is coming promised the Met Office giving this week a good omen of rising temperatures etc etc. What they forgot to tell us that a huge Atlantic depression was squeezing up against the continental anticyclone, which gave us 60 kts of breeze in St Mary's overnight and a shed load of wind and rain in Falmouth for most of the morning and early afternoon. I came out of Hendra Sports hall at 1530 having donated more than Anthony Aloysius Hancock would have envisaged and drove to Flushing making hands-free calls to crew and Race Officer. 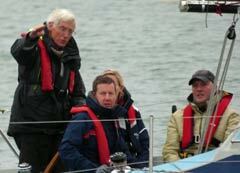 "Racing is on but no open boats", said Bob (All Weathers) Chapple the OOD. It looked quite calm at FSC so I started to bale out the dinghy, got into the big blue boat with Giles to take the RO and pin buoy to Noon Hi with Bob and Nick then fetch Matt, my crew from the dark side as they were not running transport. Trifle was rigged and almost ready to go when a late crew arrived without lifejacket or oilies. We found buoyancy for Michelle, care of Giles, and set toward the committee boat in the vicinity of Trefusis. I can't tell you what the other courses were, as we had to ask what ours was while making haste to the start line. U class were given course 73 from South West group 6 which was Gs, NBp, Tp, CCs, Gs, Fin. "Well" says I, "beat to Governor, port pole kite to North Bank etc etc?" Dream on! The wind had increase a tad and the gusts were swinging round to the West. Two boats braved Q class. Moonshine, Colin Macrea and Scorpion, Geoff Davies. Moonshine certainly got the start and was well ahead of Geoff when the hooter went as he crossed the line. They both beat in a short chop toward Governor. This was Moonshine's first foray into Q class. Last season she was firmly in W. Progress! Next the mighty U class. Now is Levity, Guy English with us or not? Anyway in Trifle we scooted along the line. I got a time from Matt when we passed the committee boat and sort of halved it minus a bit and said, "Call me one minute fifteen to go". We turned and the wind dropped as we made for the start. "B***er." I thought. But as it happened we were congratulated by the RO for our spot on start. A choppy beat to Governor ensued while a few glances back didn't sort out Levity in our mind. W class had been moved forward 5 mins as there were no V class. Huh it's not June yet! And they proved to be the real sailors bringing 4 boats to the start. Puffin, Mike Chard and Dennis Moore bounced around on the Trefusis shore while Len Cheshire in Sweet Friday kept in the relative lee of the harbour. Elli, Robin Roebuck swanned about at breakneck speed between start line and water tower. Then there was Levity? All right four of them started and beat out toward Governor. We had rounded Governor and were goosewinged toward North bank at controlled fairground velocity and unable to see what was happening with their start and subsequent racing. In the event we all finished at the club line having had a great thrash to windward and exciting downwind sleigh ride on the significant residual swells left over from the storm. In Q class Scorpion beat Moonshine. Trifle had a sail over with equal points to Wilkie as OOD. Puffin beat Sweet Friday by 25 seconds on corrected time with over 10 minutes on. You got it Levity! Robin Roebuck in Elli deciding to retire. Remember if you are not happy with the conditions, your crew, your boat and yourself then the best thing is to call it a day before you become an MCA statistic! Well done Elli for safety first!! We retired to the clubhouse thanks to Giles and that bloody awful blue boat! Nice beer on tap thanks to John. Nice food thanks to the caterers without a wait! Thanks to Jeanette and Sue in the ops room. Jack, Inez, Paul etc on the comical boat and Bob and Nick for having the wisdom and confidence to let us race.